Shaz by the Sea: May: The Month of CELEBRATIONS!! May: The Month of CELEBRATIONS!! May is typically a fun-filled month for my family, because you know -- cinco de Mayo is an Irish holiday and we celebrate like you wouldn't believe. I am kidding. Although, I personally do celebrate and enjoy May 5, it isn't why it's so busy. Instead, it is mother's day on/around May 12th and also my cousin Jodie's youngest, Kayla's birthday; my sister's birthday May 13th; my husband's grandmother's birthday May 14th, and my maternal grandmother's birthday May 15th. So May 12th-May 15th is crazy. Does anyone remember the Maypole? 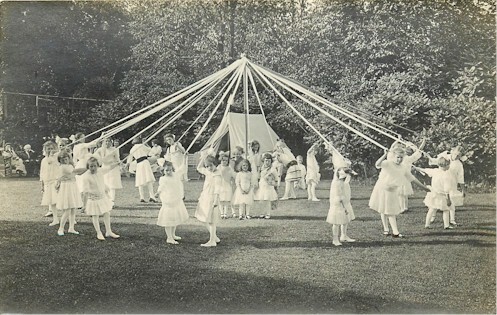 When I was in pre-k, we conducted this annual tradition which consisted of a dance around the maypole to welcome spring. It was done on May 1, also known as May Day. This year I was in LA for Cinco de Mayo and Jimbo was studying for finals. I cooked up a storm all by myself, which is seriously one of my favorites. I made avocado salsa with homemade pita chips, carne asada, and margaritas. The watermelon/lime/mint margaritas were super refreshing. I decided to surprise my sister and fly home for her SURPRISE 30th birthday party. It was so fun and we had a great turnout. Here are some pics of us getting ready at my cousin Jodie's hair salon, pics at dinner and then of course the party on Boylston St in Boston. When I got back to LA, it was time to then celebrate Memorial Day of course! My friend Keryn and her boyfriend Ricky came out for a visit. We had such a blast -- perfect weather. Here's Keryn and I hanging out at the beach. Jimbo and my bestie at work, Joe...rockin out their new Budweister t-shirts. Overall it was such a fun month...so glad I was able to see my friends and family. so much fun at Lincoln and on Boylston! COME BACK!